Assam Rural Infrastructure and Agricultural Services Society Recruitment (ARIAS) Society Recruitment 2018 August – Coordinator/ MIS Operator/ Accounts Manager/ Office Assistant :- Good news dear Job seekers. Assam Rural Infrastructure and Agricultural Services Society has published a Job notification in August 2018 for filling up various vacancy. According to the latest Assam Rural Infrastructure and Agricultural Services Society Recruitment 2018 , The ARIAS Society invites applications for the following contractual positions under the World Bank financed Assam Agribusiness and Rural Transformation Project (APART). The selected candidates will be placed in the Core Project Implementation Units (CPIUs) , Operational Project Implementation Units (OPIUs) established in the Commissionerate/Directorates/ Agencies associated with the project as well as in the concerned district level offices and in the 16 Project districts. 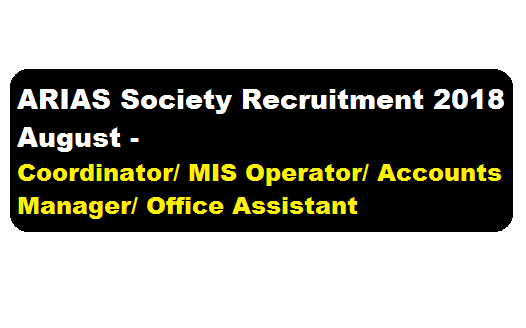 In this section, we will discuss in detail about Recruitment of various Posts under ARIAS Society Recruitment 2018 August with all the details and requirement. Educational Qualification: Master degree/ Post Graduate Diploma (minimum two years duration) in Ecology & Environment / Environmental Science/Life Science/Zoology/Botany. Experience: Atleast four(4) years of professional experience in the field of Environment Management and related activities. Educational Qualification: Masters Degree in Social Work/ Social Science/ Sociology/Political Science/ Anthropology. Experience: Atleast three(3) years of experience of working in Social Sector and related activities. Educational Qualification: Graduate or Post Graduate in Computer Science/ Information Technology/ Computer Application or Three Years Diploma in Computer Science from a recognized University/Institute ;Experience: Atleast 4 years of professional experience (in case of three years Bachelor degree/diploma holders) or three(3) years professional experience (in case of four years Bachelor degree or Post Graduate Candidate) in the field of MIS in any public/ private sector organizatio. Educational Qualification: Graduate in Commerce/ Accountancy/ Finance and Accounts from a recognized University/Institute; Experience:Atleast four(4) years of professional experience in accounting management in any Public/ Private sector organization. Proficiency in ‘Tally’ is a must. Potential candidates from India having the requisite qualification and experience may apply online through the Website of the ARIAS Society i.e. www.arias.in in the recruitment section from 00.00 AM of 17th August, 2018 till 11:59 PM (IST) of 31st August, 2018. Applications received through any other mode shall not be considered and shall be rejected by the ARIAS Society. Only the short-listed candidates will be called for interview test. However, depending on the number of applicants for a particular position, ARIAS Society may decide to hold written examination to select the candidates for the interview /test.